To turn my yeast-free gluten free hamburger buns (a version of which is in Quick & Easy) into more of a Hawaiian-style roll, skip the vinegar in the ingredient list and replace the 1/2 cup milk with 1/2 cup pineapple juice. What you see pictured here are the actual gluten free Hawaiian rolls from the new gluten free bread book, and I have been making them every single week for months since my family just cannot get enough of them. They’re lightly sweet, deliciously fragrant, and perfectly soft, plus the dough itself is a true pleasure to shape. Like most of the recipes in the new book, the dough for these rolls is best when it is set to rise slowly, even for a few days, in the refrigerator. Then, on baking day, you shape the dough while it’s still cold, set it to rise after shaping (less than an hour), and then bake and indulge. 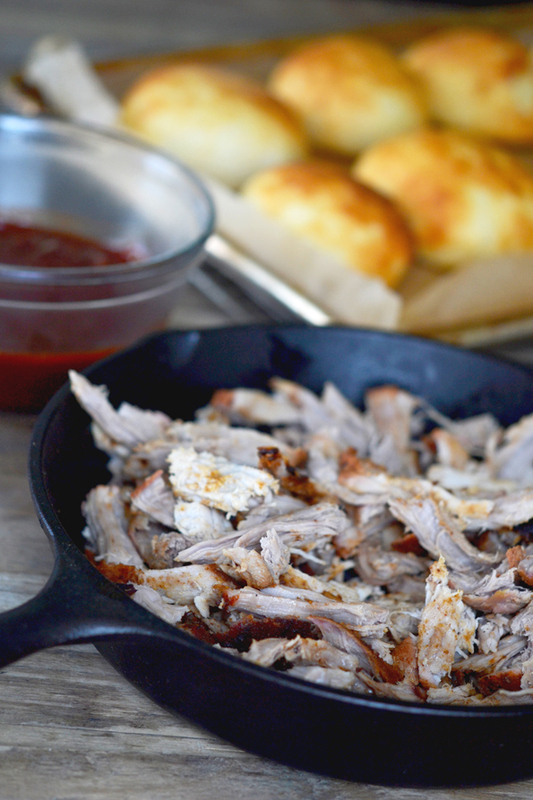 This pulled pork is made with pork loin, which is a leaner cut than pork shoulder. The reason? You have to cook pork shoulder for a whole lot longer than you do pork loin, to bring it to 145°F (safe cooking temperature for pork). A shorter cooking time plus the fact that you cook this at only 300°F means that your kitchen really won’t get overheated. Just do your best not to overcook the pork or it will end up dry, but it’s not so fussy that cooking it to 10°F over the recommended 145°F internal temperature is a real problem. You’re going to be smothering it in homemade barbecue sauce anyway. You also want to be sure that you shred or “pull” the pork when it’s still warm, or it is more likely to come apart in clumps. Not that that is a huge problem, either. 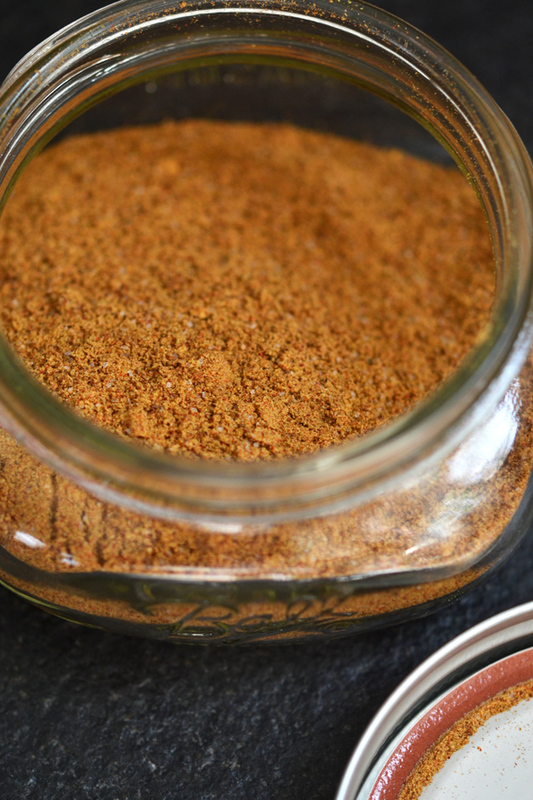 This simple, smoky spice rub is worth doubling and having on hand for using on, say, skin-on, bone-in chicken thighs before grilling them. And have we ever talked about how much I never, ever buy bottles of dressing or sauce? It’s just too easy to make your own, and then you don’t have to hear all those half-empty bottles rattling around every time you open and close your refrigerator. Remember the roasted shallot vinaigrette dressing that we served with that gluten free pasta salad? For a vinaigrette, you only have to know one single ratio. Three:one, oil:acid (like vinegar, lemon juice or a blend). That’s all. So if you want 1 full cup of dressing, it’s 3/4 cup oil + 1/4 cup vinegar = 1 cup vinaigrette. Then, add a dash of kosher salt, maybe a teaspoon of honey for a honey vinaigrette? Or not. Your call. Barbecue sauce is something else that shouldn’t be bought. It should be made. I do generally start with a bottled tomato ketchup, though. Let’s not go overboard. 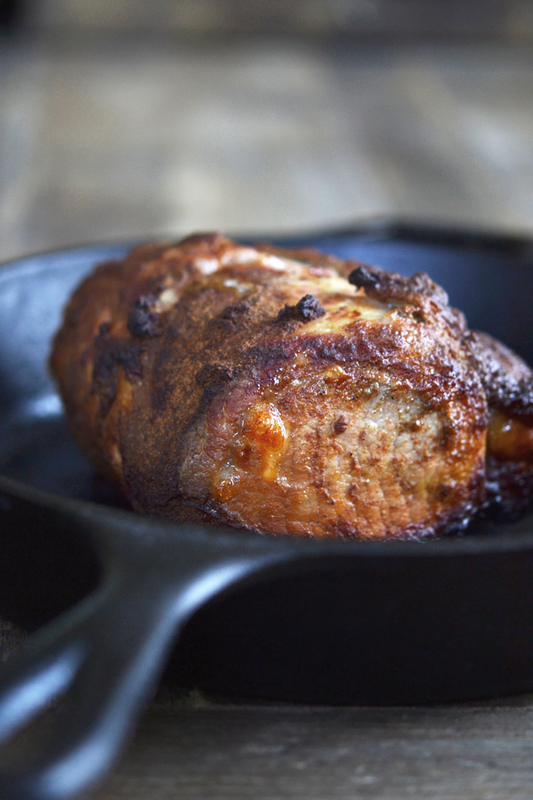 Pat the pork loin dry and place it in a roasting pan or Dutch oven. In a small bowl, combine all of the remaining ingredients of the dry rub, and whisk to combine well. Scatter all of the dry rub on the pork, and gently rub it into the meat on all sides. Allow the meat to rest, fat side up, for about 45 minutes at room temperature. While the meat is resting, preheat your oven to 300°F. Place the roast in the preheated oven and cook for about 1 hour 45 minutes, or until an instant read thermometer inserted into the center of the meat reads 145°F. Remove the meat from the oven and allow it to cool until you are able to handle it (it should still be very warm, as it is easier to shred than when it is cold or at room temperature). Peel off and discard the fat from the top of the roast, and pull apart and shred the meat with your hands or with two forks. Make the barbecue sauce by combining all of the ingredients in a large bowl. Whisk to combine well. Place the shredded pork in the sauce, and toss to coat the meat thoroughly. Serve the pork on the buns, with the cole slaw on the side. The barbecue sauce is adapted from Gluten-Free on a Shoestring: 125 Easy Recipes for Eating Well on the Cheap. The pork is adapted from Melissa Clark in the New York Times Dining Section. P.S. If you haven’t yet, please pick up a copy of Gluten-Free on a Shoestring Quick & Easy. I can’t keep the blog going without your support! I am uber stoked about the bread book. So so excited. I love baking bread, and making people believe gluten free food can be delicious. I get excited about the idea that nothing is out of reach even when your diet is restricted. Cannot wait til November. You’re singin’ my son, Kristy! That’s exactly it. Nothing is out of reach, and we’re going to prove it together! Wouldn’t 2/3 c oil & 1/3 c vinegar be a two:one ratio? for 3:1 it would have to be 3/4 c oil & 1/4 c vinegar. I’m not sure whether to add your new book to my cart or wish list. My son loves it when I put cookbooks on the wish list. Then he can help me choose recipes to try when I unwrap his gifts. Yes, Susan! I just fixed my error. Sorry about that. Your last few posts are like you are reading my mind…I’ve been craving Hawaiian buns for about 3 days and can’t wait to try out this recipe. I have powers, Lisa. I don’t want to freak you out, but I know stuff. Good point, Anon. Very true! THESE look amazing! My only problem is the whey powder …can I just leave it out? Will it mess things up? I am so looking for something Hawaiian bread that I can have when my husband walks around eating his (he won’t do gluten free at all!) Thanks! You can’t just admit it, Elisabeth. I haven’t tested the recipe with substitutions, so you’ll have to experiment! I know I know….I wondered why I hadnt tried the buns in your cookbook yet. I really hate Udis. Does anyone have any dairy free suggestions to sub for whey? If it didnt make me sick for a week or more I wouldnt be so picky! oh yes – I forgot about this bun/roll recipe and I love the subs to make them Hawaiian – those little buggers were so yummy! 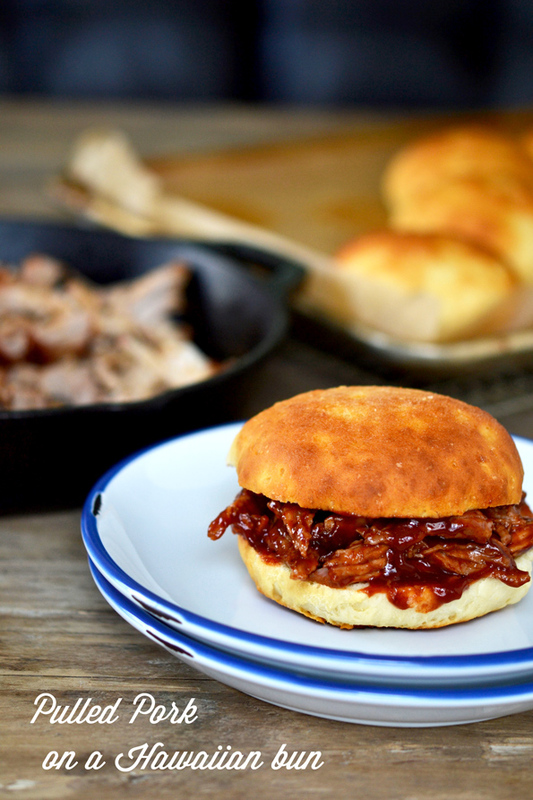 I’ll have to make some up for the next time we have this pulled BBQ pork (YUM-O!!!) recipe (thinking July 4th holiday) or hamburgers. We had hamburgers at home this weekend and my little one that is also exclusively GF with me says, “Where’s the buns, Ma, where’s the buns?” I hadn’t gotten around to it… GF Mommy fail? You know there will be, Jennifer! Tell that little guy that the buns are coming! I feel very un-American because I hate barbecue sauce. And ketchup. I’m sure your barbecue sauce is excellent, though! Over the weekend I was watching a cooking show, and it reminded me of another no-bake food that you should totally make. Speculoos. Plus, I think anyone having to be nut-free would love it! Speculoos (or Speculaas as we call it) should really be a December recipe. I admit it is nice the whole year around but us Dutch associate it with December celebrations! Oooh and my kids LOVED the pulled pork!! Marjan, Donia is referring to the spread. Glad your kids loved the pork!